Welcome to another October, 2013 issue of GL Communications' Newsletter providing information and insight into our MAPS™ Skinny Protocol Emulator and PacketScan™ - Skinny Protocol Analysis applications. Skinny Call Control Protocol (SCCP), also referred to as "Skinny," is a Cisco Systems proprietary signaling and control protocol used to communicate between IP devices and Cisco Unified Communications Manager for call establishment, teardown, and control in VoIP environments. It is widely deployed in VoIP enterprise solutions and is increasingly supported by third-party service provider. It is a simple, lightweight, very feature-rich stimulus protocol deployed in conjunction with Cisco IP phones. IP Phone registers its IP, type, & name with the Cisco Call Manager (CCM), and provides its "Capabilities" (voice/video codec supported) to CCM capability request message. Phone periodically sends "KeepAlive" messages to the CCM. Alarms are also sent in case of network errors. Offhook (place call) - When the phone goes offhook (place call), the CCM instructs with the lamp on/off, through the prompt, key settings, and the dialtone messages. Onhook (end call) - When the phone goes onhook (end call), the CCM instructs the phone to stop transmitting, close the channels, set the call status to disconnect, and send the default user prompt. Media Transmission includes Conference ID, Pass through Party ID, Remote IP & Port Address, Packet, Payload Capability, Max Frames per Packet details. GL's MAPS™ (Message Automation and Protocol Simulation) is an advanced and versatile protocol simulator/tester that can simulate a variety of protocols encountered in the telecom space, including ISDN, CAS, SS7, VoIP, Wireless (2G,3G & 4G) and others. MAPS™ is now enhanced to support 'Skinny' - SCCP, Cisco Systems proprietary signaling and control protocol. 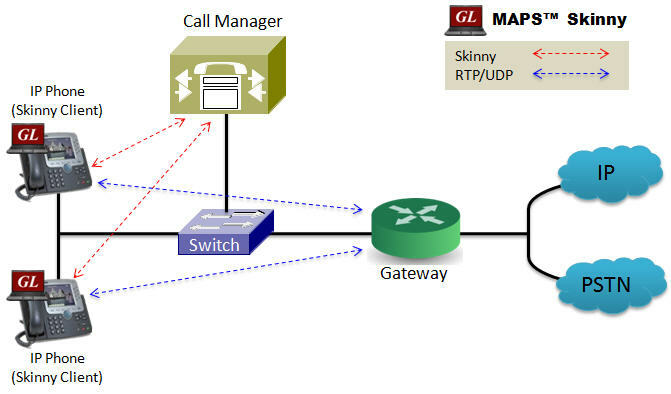 GL's MAPS™ Skinny Emulator can be used to emulate IP Phones (Skinny Clients) in VoIP environment. In addition to call simulation in VoIP environment, the emulator also supports error tracking, regression testing, conformance testing, load testing, and message generation. It can run pre-defined test scenarios against test objects in a controlled & deterministic manner. MAPS™ Skinny Emulator supports powerful utilities like Message Editor, Script Editor, and Profile Editor, which allow new scenarios to be created or existing scenarios to be modified. Call Generation feature allows the user to simulate incoming and outgoing communications in VoIP environment. Skinny call control simulation between IP Phone (Skinny Client), and Call Manager, using proper scripts and profiles. The profile allows necessary parameters of call controls to be changed during runtime. MAPS™ Skinny configured as IP Phone (Skinny Client) can register and receive the incoming calls (Inbound) from the Call Manager (DUT). MAPS™ Skinny configured as IP Phone (Skinny Client) can simulate outgoing communications by sending call control messages and perform media transmission after the call is established with the Call Manager (DUT). The ready scripts used can detect events and respond with appropriate actions with respect to the states. The Events encountered during the progress of the calls are logged as seen in the screen below. GL's PacketScan™ - an All-IP Network Monitoring software supports decoding of almost all industry standard signaling protocols including Skinny (SCCP) protocol. For comprehensive information on the applications, you can visit MAPS™ Skinny Protocol Emulator and PacketScan™ web page.